Editors: Arulmani, G., Bakshi, A.J. and Leong, F.T.L., et.al. 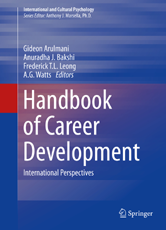 The central objective of this handbook is to draw the wisdom and experiences of different cultures together to consider both universal and specific principles for career guidance and counseling that are socially and economically relevant to contemporary challenges and issues. This book is focused on extending existing concepts to broader contexts as well as introducing new concepts relevant to the discipline of career guidance and counseling.